Practice Attire - Goggles, mouth guards and lacrosse sticks are mandatory and cleats are recommended for each practice. Goggles must be worn immediately upon stepping on the turf or grass for all players protection. 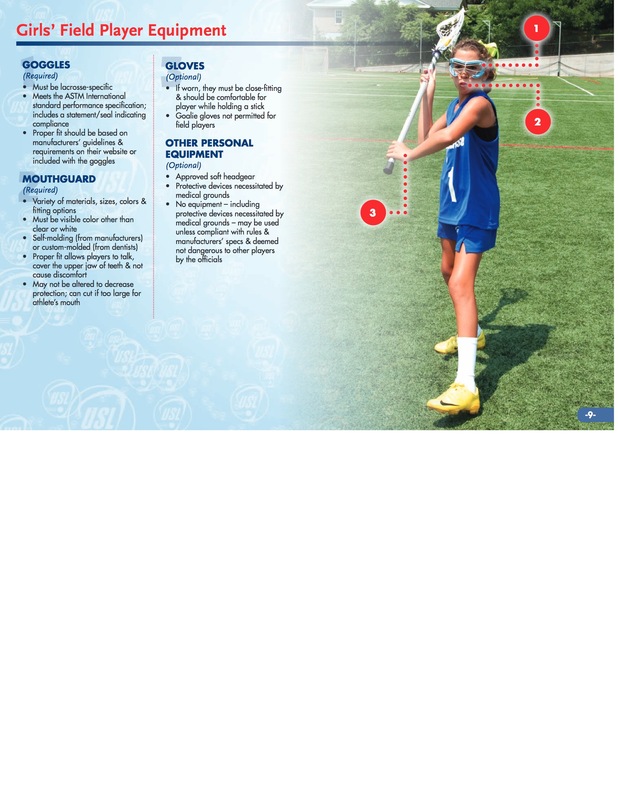 Lacrosse Stick - there are a wide variety of sticks available at various price points. Our players, no matter what age, have had the best success with the STX Crux 300, Brine Mantra 2 or 3, Brine Dynasty Elite. What sets these sticks apart is the offset head design, soft pocket which helps players develop their craddling, passing, catching and shooting skills at a rapid rate. Mastering these skills is critical to the success and enjoyment of the sport. Every year we have players who buy an inferior stick, struggle unnecessarily, borrow a better stick and have a break through game. By this point, they have lost 4 weeks of development, their parents end up buying an Crux, Mantra or Elite and out the cost of two sticks. There are some good deals on-line if you shop around on-line for the best price or you can pick up at Thompson's. Mouth guard - these are mandatory and may not be clear. It is important to have a proper fitting mouth guard to prevent injury and your daughter from ruining it from chewing on it.